Rembrandt Harmenszoon van Rijn (1606–1669), David and Jonathan (detail) (1642), oil on panel, 61.5 x 73 cm, Hermitage Museum, Saint Petersburg. Wikimedia Commons. In the five hundred or so years which had elapsed since drying oils had first been used to make artistic paintings, virtually no use had been made of the surface texture of the paint layer. The expected standard for oil paintings was a smooth surface finish, although some painters had (controversially) left brushmarks and other evidence of the painting’s making. The first major oil painter to exploit many of the visual effects achieved by manipulating surface texture was Rembrandt, particularly in the later part of his career. Many of Rembrandt’s paintings from before 1650 have fairly conventional ‘finished’ surfaces – his monumental Night Watch is a good example. By about 1660, though, many of his paintings had quite rough surfaces which significantly alter their optical properties. 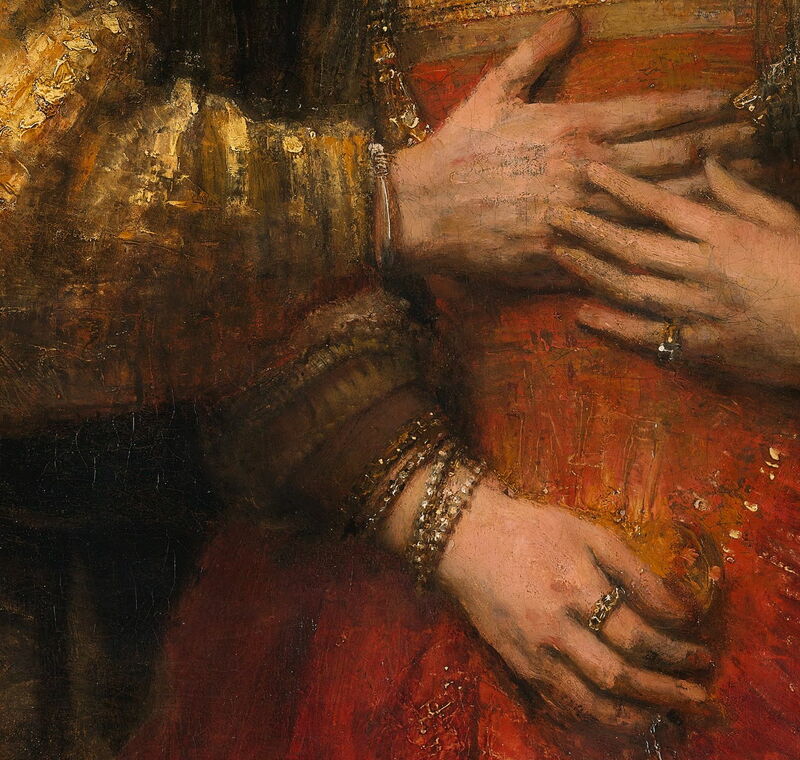 In this detail of his The Jewish Bride (c 1667), highlights on the sleeve and jewellery have been applied roughly, although it is still a matter for speculation as to exactly how he achieved that. Lower down, on the red dress of the bride, the duller top layer of paint has been scraped through to reveal lighter lower layers. The end result is a painting which creates its visual effects as much by its surface textures, as by form or colour. 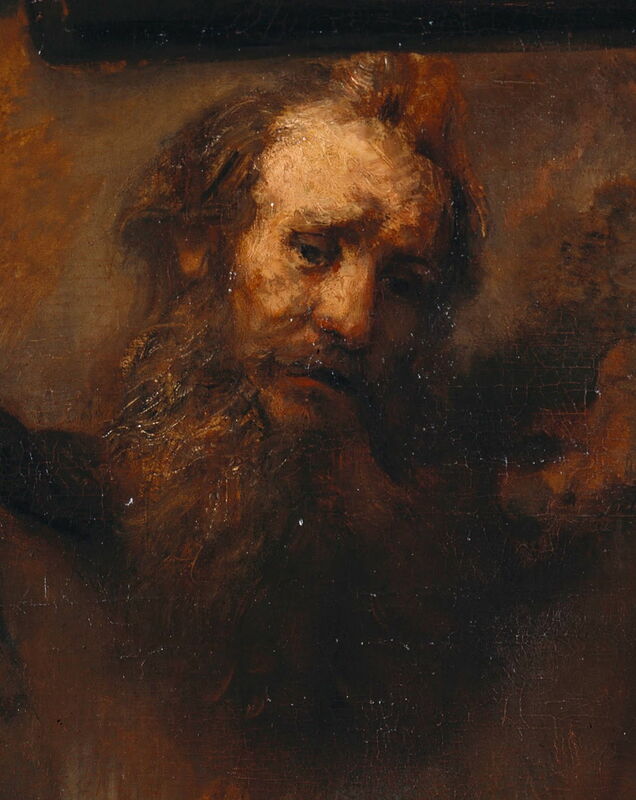 This may have arisen as Rembrandt extended the techniques which he used in oil sketches and studies to his ‘finished’ paintings. 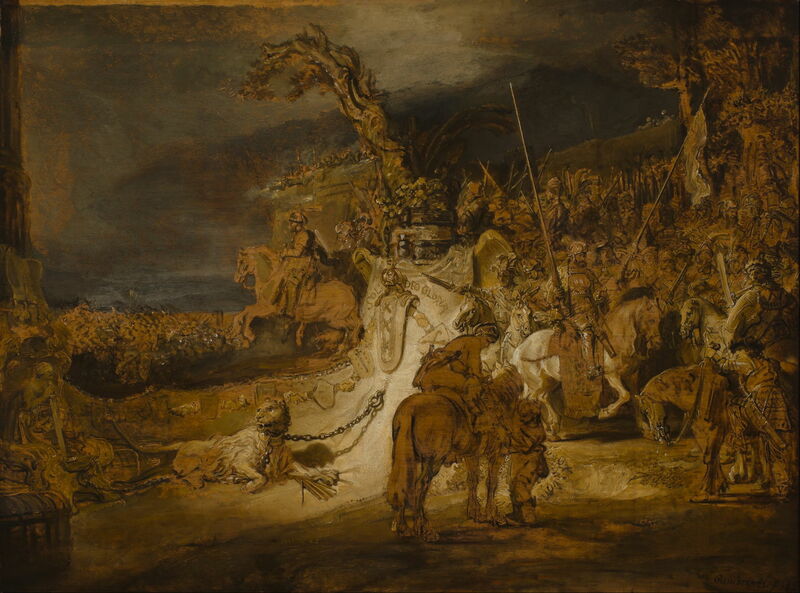 Rembrandt Harmenszoon van Rijn (1606–1669), The Concord of the State (sketch) (1635-41), oil on oak panel, 74.6 x 101 cm, Museum Boijmans Van Beuningen, Rotterdam, The Netherlands. Wikimedia Commons. 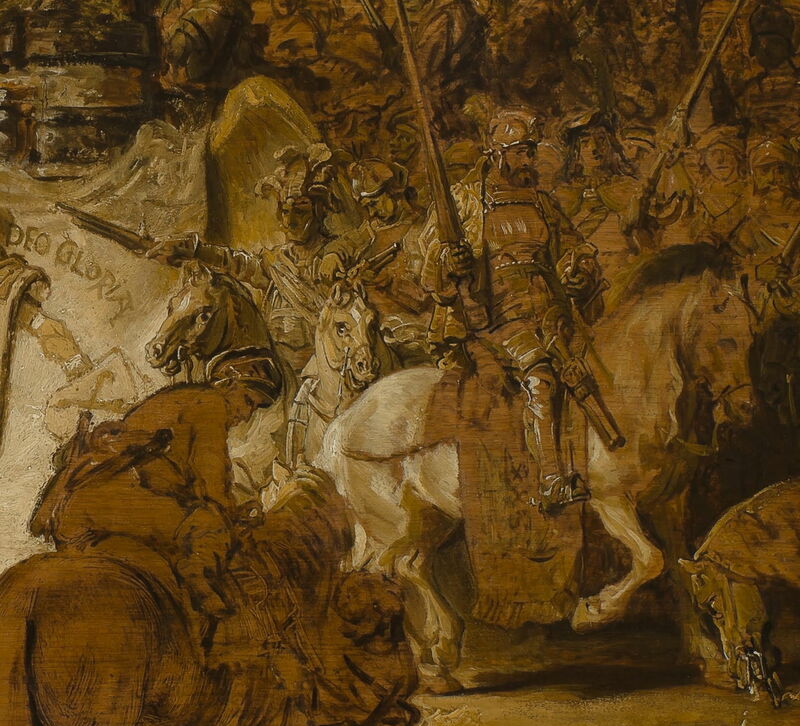 Rembrandt Harmenszoon van Rijn (1606–1669), The Concord of the State (sketch) (detail) (1635-41), oil on oak panel, 74.6 x 101 cm, Museum Boijmans Van Beuningen, Rotterdam, The Netherlands. Wikimedia Commons. His large and elaborate oil sketch for The Concord of the State (1635-41) has daubed-on highlights, with some passages becoming quite textured as a result. Rembrandt Harmenszoon van Rijn (1606–1669), Moses Smashing the Tablets of the Law (1659), oil on canvas, 168.5 x 136.5 cm, Gemäldegalerie, Staatlichen Museen, Berlin. Wikimedia Commons. Rembrandt Harmenszoon van Rijn (1606–1669), Moses Smashing the Tablets of the Law (detail) (1659), oil on canvas, 168.5 x 136.5 cm, Gemäldegalerie, Staatlichen Museen, Berlin. Wikimedia Commons. 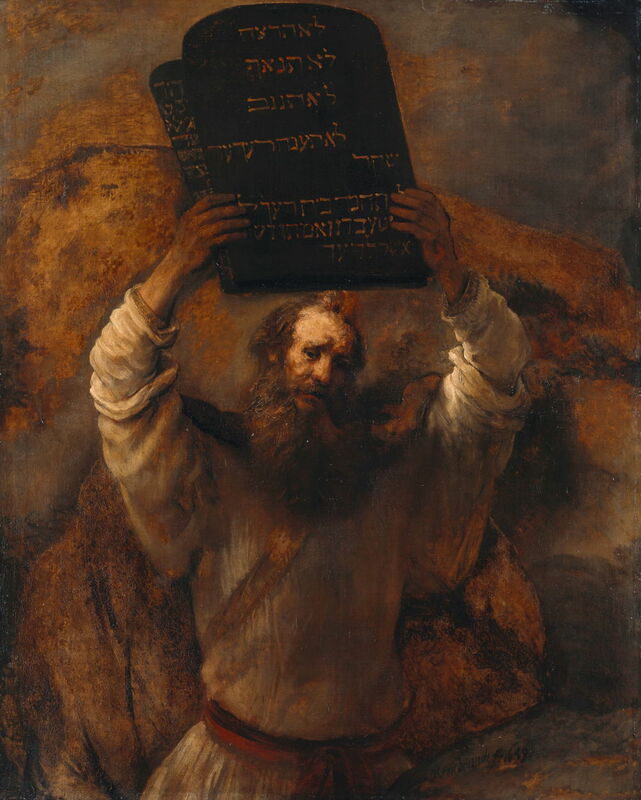 Nearly twenty years later, his Moses Smashing the Tablets of the Law (1659) has flesh and hair which is depicted in part by similar techniques, although this painting is fully coloured. Rembrandt Harmenszoon van Rijn (1606–1669), David and Jonathan (1642), oil on panel, 61.5 x 73 cm, Hermitage Museum, Saint Petersburg. Wikimedia Commons. 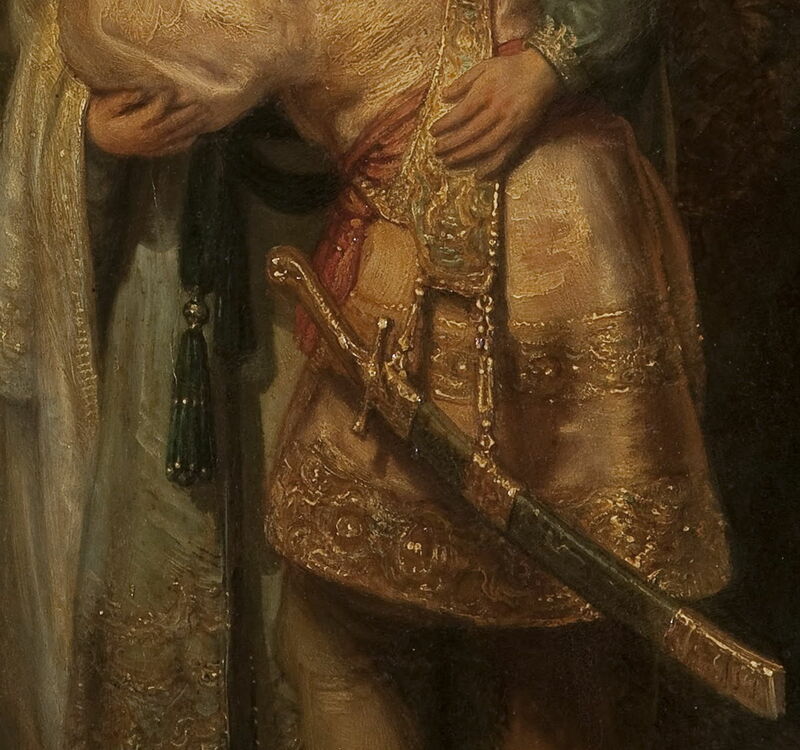 His surface textures are usually richest in passages depicting fabrics, decorated metals, and the like, but in his David and Jonathan (1642) even plain textiles bear fine brushmarks. This was well before the date usually accepted for his radical late style. 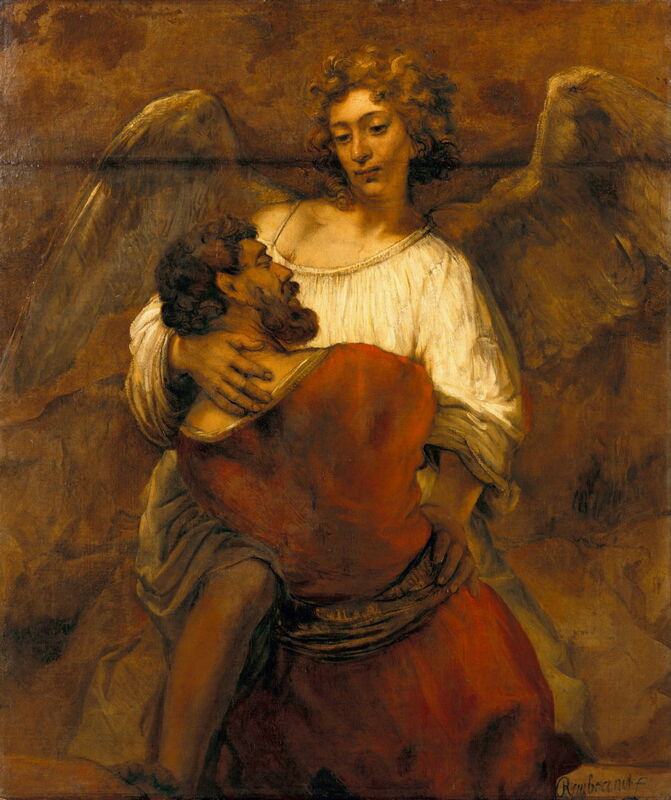 Rembrandt Harmenszoon van Rijn (1606–1669), Jacob Wrestling with the Angel (c 1659), oil on canvas, 137 x 116 cm, Gemäldegalerie, Staatlichen Museen, Berlin. Wikimedia Commons. Rembrandt Harmenszoon van Rijn (1606–1669), Jacob Wrestling with the Angel (detail) (c 1659), oil on canvas, 137 x 116 cm, Gemäldegalerie, Staatlichen Museen, Berlin. Wikimedia Commons. 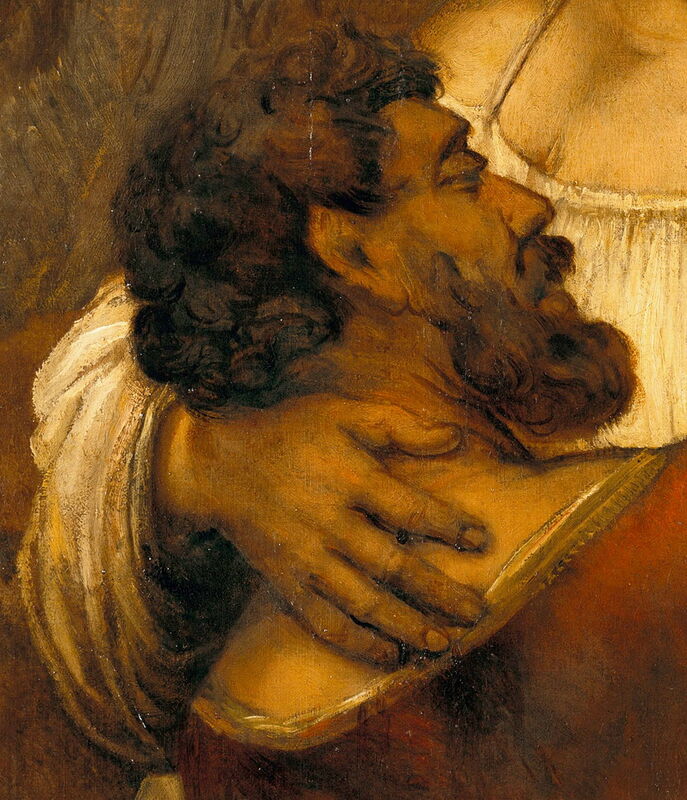 Although it is hard to see the surface texture in this image of his Jacob Wrestling with the Angel (c 1659), the angel’s white gown is obviously textured, and the skin shows fine brushmarks too. Perhaps one of Rembrandt’s secrets which so many have sought therefore lies in how he was able to exploit surface texture in this way – thus, in his paint. That is the ‘secret recipe’ which Maroger, Redelius, and others claimed to have discovered. Systematic analyses of Rembrandt’s paint layers by White and others soundly rebutted the ‘secrets’ claimed. In the main, Rembrandt used linseed oil as his binder, occasionally using walnut oil as well, and just once poppy seed oil. In some passages the oil had been thickened by heat treatment, but this was by no means widespread. Traces of pine resin found in some samples may have been introduced during retouching, and do not appear to be a feature of Rembrandt’s impasto work; neither is there any evidence that he added wax to his oil paint to give it body (a favourite claim ever since the early visual examinations of Eastlake). 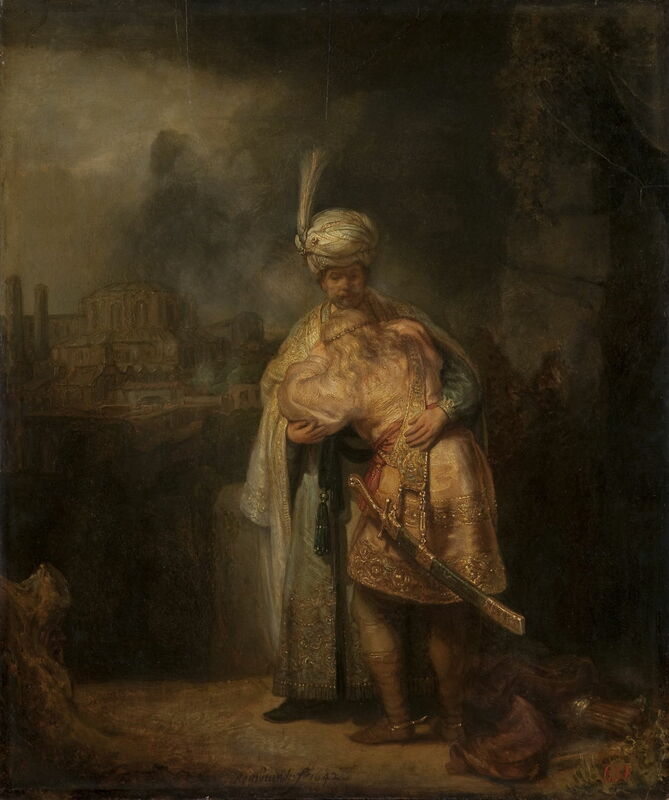 White’s research at the National Gallery in London was followed by the Rembrandt Research Project, which included analyses of samples from The Jewish Bride (c 1667) and other notable late works. That later work suggested that Rembrandt’s secret might have been the addition of small amounts of egg to the paint, but subsequent work has reversed that by suggesting that the analyses were more consistent with lead soap formation in the paint layer, not from the presence of egg proteins. Others have suggested that Rubens and Rembrandt may have discovered how to make thixotropic oil paint, which is both easily brushable and retains brushmarks. As no one else appears to have made oil paint with such properties, that remains purely theoretical. What few seem to have considered is the five hundred years of experience, of many painters and their workshops, in getting oil paints to just the right viscosity and handling, despite the effects of different pigments. If the illustrious predecessors of Rubens and Rembrandt were able to produce oil paints which handled right using (mostly) linseed oil and pigment, was there ever any need for dark secrets? Surely the reason that no one before Rembrandt exploited surface texture in the ways that he did, is because earlier painters wanted a flush, smooth surface – not because they were technically incapable. For me, though, looking at Rembrandt’s late works, the greatest mystery is how he was able to work on the paint surface from a distance of less than a metre, producing visual effects which you can only see when you stand several metres back from the painting. That is the product of great experience, vision, and true genius. van de Wetering E (1997) Rembrandt, The Painter At Work, revised edn., Amsterdam UP. ISBN 978 90 8964 033 8. Posted in General, Painting, Technology and tagged history of painting, oil paint, oil painting, painting, Rembrandt, Rubens. Bookmark the permalink.